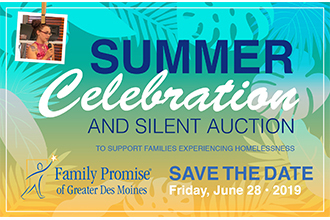 Join us for a fun evening of music, food and fundraising for families experiencing homelessness! We will celebrate the wonderful efforts of volunteers, donors and friends with food, music and a silent auction. there will be a 50/50 raffle (tickets are $5 and you must be present to win.) Tickets are $40 and available for purchase online or by calling (515) 277-7051.